Bharatiya Janata Party president Amit Shah arrived in Patna on Thursday and met Bihar Chief Minister and JD-U chief Nitish Kumar over breakfast. Shah is in the Bihar capital on a daylong visit to interact with party leaders and workers to design strategies ahead of the 2019 Lok Sabha elections. On reaching Patna, Shah was greeted by a team of BJP leaders, including the Union ministers from Bihar and Deputy Chief Minister Sushil Kumar Modi, at the Patna airport. He headed straight for the state guest house near Raj Bhawan, along with senior party leaders, where he met Nitish Kumar, the president of Janata Dau (United) that’s a key ally of the National Democratic Alliance. Shah and Kumar are expected to hold crucial discussions on seat sharing for the 2019 polls when they meet again on Thursday at the latter’s official residence for dinner. This is Shah’s first visit after Nitish Kumar’s JD-U joined the NDA in July 2017, ditching the Grand Alliance it had stitched with the Rashtriya Janata Dal and the Congress ahead of the 2015 Assembly elections. Unprecedented security arrangements have been made in Patna for Shah’s visit, with thousands of security personnel deployed and traffic diversions put in place. 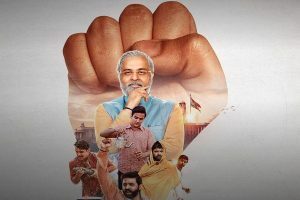 The entire state capital city is dotted with colourful hoardings, banners, gates and posters highlighting the four years of Narendra Modi government at the Centre. Shah will be holding a series of meetings and discussions with party leaders and workers on the preparations for the 2019 general elections. He will interact with 10,000 ground level party workers who head booths, and also meet social media activists to discuss the digital campaign, according to local BJP leaders. Meanwhile, all eyes will be on how the dinner meeting Shah and Nitish turn out. 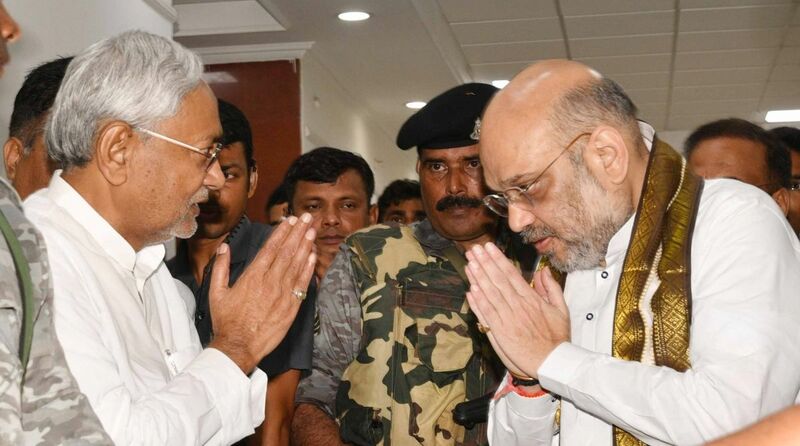 While sources in both the BJP and the JD(U) said a detailed discussion on seat-sharing might not take place, it was expected that the two leaders would arrive at a broad understanding on issue been plaguing the alliance for the last few months. Recently, a number of JD(U) leaders have said the party should be allotted a number of constituencies — commensurate with its standing in the state Assembly. In Bihar, JD(U) has the highest tally among the partners of the BJP-led coalition. The other two NDA allies in Bihar are LJP and RLSP, headed by Union ministers Ram Vilas Paswan and Upendra Kushwaha, respectively. Quoting sources in the LJP and RLSP, a PTI report said both Paswan and Kushwaha were abroad and it was not clear whether anyone from the two parties would be attending any of the functions to be attended by Shah. The NDA had won 31 of the 40 seats in Bihar in the 2014 Lok Sabha polls. JD(U) had contested the polls separately with Left parties, and had managed to win only two seats.